For a time, Nelson Algren was America's most famous author, lauded by the likes of Richard Wright and Ernest Hemingway. Millions bought his books. Algren's third novel, The Man with the Golden Arm, won the first National Book Award, and Frank Sinatra starred in the movie. But despite Algren's talent, he abandoned fiction and fell into obscurity. The cause of his decline was never clear. Some said he drank his talent away; others cited writer's block. The truth, hidden in the pages of his books, is far more complicated and tragic. Now, almost forty years after Algren's death, Colin Asher finally captures the full, novelistic story of his life in a magisterial biography set against mid-twentieth-century American politics and culture. Drawing from interviews, archival correspondence, and the most complete version of Algren's 886-page FBI file ever released, Colin Asher portrays Algren as a dramatic iconoclast. A member of the Communist Party in the 1930s, Algren used his writing to humanize Chicago's underclass, while excoriating the conservative radicalism of the McCarthy era. Asher traces Algren's development as a thinker, his close friendship and falling out with Richard Wright, and his famous affair with Simone de Beauvoir. Most intriguingly, Asher uncovers the true cause of Algren's artistic exile: a reckless creative decision that led to increased FBI scrutiny and may have caused a mental breakdown. In his second act, Algren was a vexing figure who hid behind a cynical facade. He called himself a "journalist" and a "loser," though many still considered him one of the greatest living American authors. An inspiration to writers such as Hunter S. Thompson, Martha Gellhorn, Jimmy Breslin, Betty Friedan, Cormac McCarthy, Don DeLillo, Russell Banks, and Thomas Pynchon, Algren nevertheless struggled to achieve recognition, and died just as his career was on the verge of experiencing a renaissance. 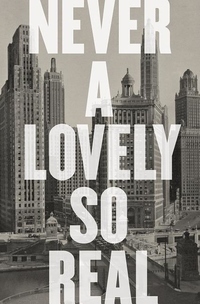 Never a Lovely So Real offers an exquisitely detailed, engrossing portrait of a master who, as esteemed literary critic Maxwell Geismar wrote, was capable of suggesting "the whole contour of a human life in a few terse pages."